For the average Indian gemstones have much more meaning than being fancy baubles or prized possessions. The gemstones are highly symbolic of the planetary powers so they go beyond ornamental purposes and are used as a revered medium of bringing about a positive change in life. Strange but true, when people of note are seen to wear planetary gems, the appeal increases and so does the curiosity. 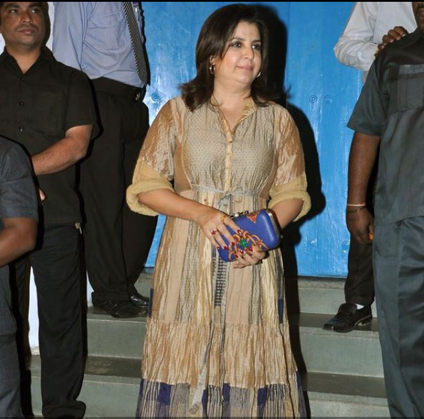 One can invariably see the rich and famous wearing some gemstone. One could look at it the other way round where the gemstone’s power has brought about the noteworthiness, fame and fortune. 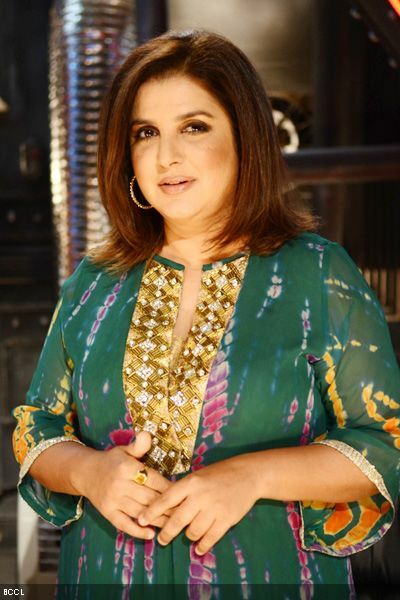 Of late among the well-known Bollywood celebs, one can see a slimmer looking director – choreographer Farah Khan in the media. 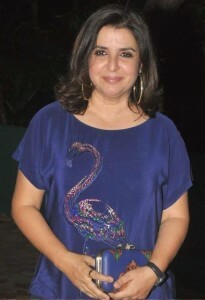 She has directed Om Shanti Om and choreographed many a hit numbers. She can be seen wearing a yellow sapphire in gold ring in the index finger of right hand. 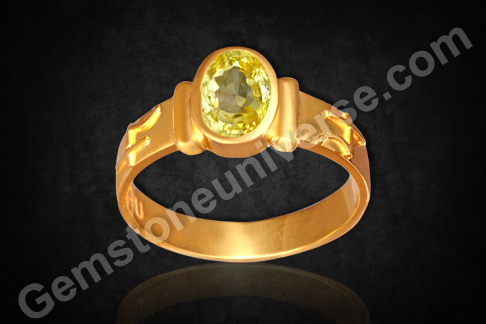 The energy of yellow sapphire takes one towards the path of action rather than procrastination. It shakes away all doubt and induces a strength of will. The energy of this gemstone has the frequency of prosperity and wealth. It’s an excellent stone for success in business. Yellow sapphire can help one overcome self-doubt and fear of failure. Precious coral is captivating gemstone – with its smooth surface and robust color, the gemstone is absolute imagery of vitality and symbolizes youthful vigor. – Nothing can replace lab certification. A good vendor will give you a certified gem that lists the verified properties of the specimen. – Precious red coral measures 3.5 on Moh’s scale and has a specific gravity of 2.65- 2.68 which will be clearly stated on the certificate helping in identification. 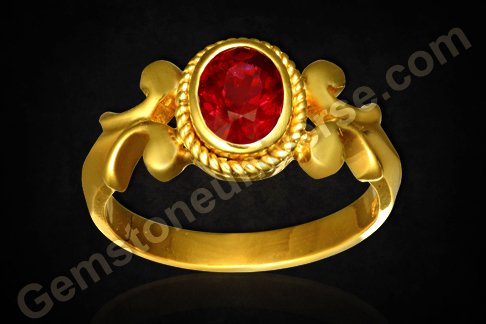 Precious red coral is an opaque gemstone, it has a refractive index of 1.48. 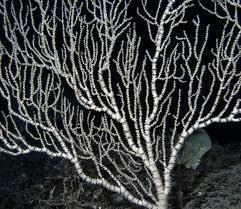 – Don’t get taken in by fancy names like Taiwanese coral. While previous coral does exist there, it faces a crisis as reefs are threatened by pollution. An entire plastic coral industry has come up which produces look-alikes that could confound anyone! Available Easily Taiwan plastic coral – How do you distinguish? – Bamboo coral, which is also a coral found growing in the sea, but not precious coral is dyed and palmed off to unsuspecting buyers. Make sure you ask the right questions and do a minimum homework before making a valuable purchase. – Precious red coral will display a wood grain texture under magnification, which may not show in case of resin filled, wax treated coral, as it would give a texture too good to be true. A variety of techniques can be use to determine if the color of a piece of coral is dyed or is a fake. However, these techniques like acetone exposure or heating will destroy the specimen being tested! A lab report and a trusted source always hold the key to a good buy. Featured today is a natural and organic red coral of 4.94 carats. The rich Mediterranean ox blood color of the coral and the smooth blemish free surface of the gem allow it to stand apart. 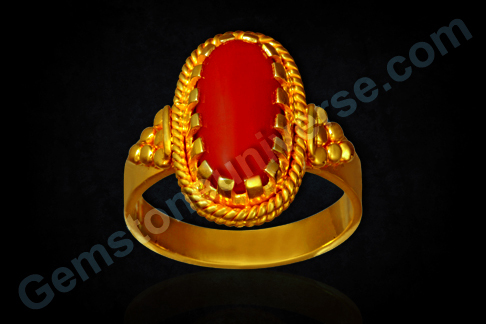 The cabochon cut red coral is from Italy and meets all the criteria for a premium jyotish quality gem. Natural red coral or moonga is the gemstone of planet Mars/ Mangal and is used to harness its extraordinary powers. 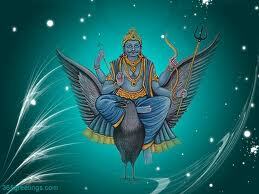 Among the navagrahas, Lord Shani or Saturn is probably the most feared and the most misunderstood. It is only natural for children to dislike the hour when a strict teacher takes a class and to revel with an easygoing jovial one! Just similar is the case with human beings and planets – while the planetary period or influence of a soft planet or a yogkaraka is enjoyable, the planetary period of karmic planets, especially like that of Saturn brings difficult lessons and relentless troubles. Lord Saturn in Vedic astrology and among the planets is the grandmaster of karmic retribution. 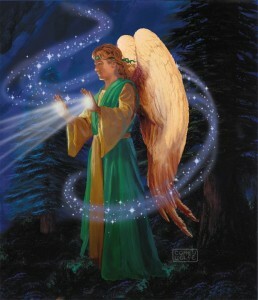 He is largely instrumental in balancing the karmic books of individuals. In the sacred texts, he is described as having emaciated and long physique, tawny eyes, windy in temperament, big teeth, is indolent and lame, and has coarse hair. He is depicted usually with a sword, arrow, trident and riding a raven/ crow/ vulture. His imagery is dark and scary conveying his hard taskmaster, no-nonsense aura completely. While his dasha or period of influence can be very hard, good conduct, sincerity, forgiveness and a life of truth and ethics can bring much relief as these are the very virtues Shanidev tries to impart – to convert ignorance and pain into lasting wisdom! 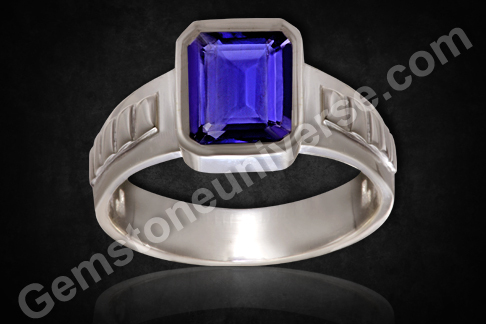 One can also find much relief by wearing his gemstone – blue sapphire, if Saturn is placed favourably in the birth chart. There can also be decrease in intensity of pain by praying to Shiva who is his guru, by praying to Hanuman especially on Saturdays and by visiting the Shaneeshwara temple on Saturday evenings. Individuals can make a pilgrimage to the Thirunallar temple in Kumbhakonam, Tamil Nadu and seek the grace from Lord Shani, who is regarded to be in his benevolent form in this particular temple. Featured today is a fully natural and treatment free Ceylon blue sapphire of 3.14 carat set in Sterling silver as a Saturn talisman ring. 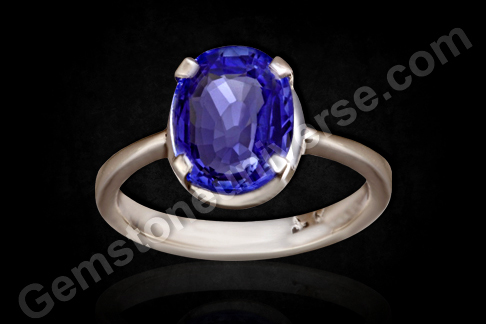 This unheated blue sapphire is a tantalizing oval with excellent clarity and scintillating blue color with violet overtones.Natural blue sapphire or neelam gemstone is the gem of Lord Saturn and is used in a talisman to harness the energies of this planet. The amethyst is one of the most alluring gemstones from the entire smorgasbord – be it the alluring color, the appeal or its versatility to sit beautifully in any piece of jewelry. The amethyst is a purple quartz that has an amazing range of saturation of color – from the light purple tones to the coveted purple with red flashes, when viewed in light, termed the deep Siberian purple. The amethyst is also known as Katela in Hindi is an upratna for natural blue sapphire. Aside of harnessing the powers of planet Saturn or Shani as he is known, it is a gem known for helping heal dependency on alcohol. When used properly it ensures that the wearer instinctively does not feel the need to consume alcohol and even if one tries to indulge, one does not enjoy ultimately leading to freedom from alcohol. It is also a wonderful gemstone for fine tuning one’s meditative capacity and is excellent for fine tuning intuition. It makes the heart free from complexes, traumas and other psychological barriers. Featured today is a fine amethyst of 6.41 carats from Brazil. 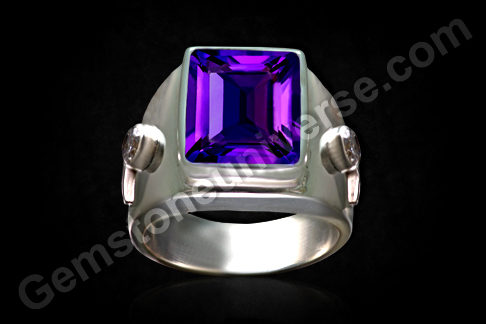 The natural and treatment free emerald cut amethyst has a lovely purple color and has been set in Sterling silver. The gem is accented by diamond simulants. The amethyst has excellent clarity.Note: The above links generally exist on the website for a period of 40 days after which they are periodically deleted to make way for new gemstones and to enable faster browsing. It is quite likely in any part of the world that one may invariable find garnets to be a part of jewelry that has been handed down generation to generation. It has been a popular gem throughout. The name garnet has been taken from the appearance of the garnet crystals that appear in a literal seed like arrangement, akin to that within a pomegranate. Garnets as a species cover a wide variety and colors from alamandite, pyrope, uvarovite, demantoid, rhodolite etc. From a planetary gem therapy perspective, the most important garnet is hessonite garnet. 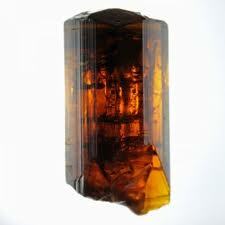 It is a grossular garnet found in Srilanka as well as in some pockets of Brazil. 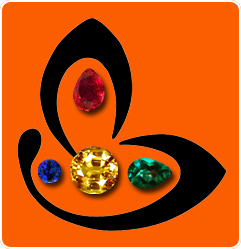 The world of gemstones is very complicated and even more so as the awareness regarding gems is very limited. 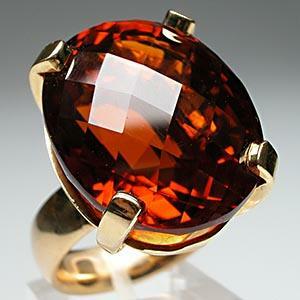 Just to give you an idea, here are some of the look-alikes of the cinnamon stone – the hessonite garnet. The cognac like rich color is appreciated much in natural zircon. Brown Topaz is sometimes irradiated to get a richer color. 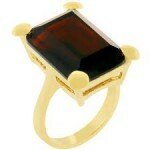 Named after the famous Portuguese Madeira wine, for its red brown, honeyed caramel color, this is a warm gemstone. Coming to the real question – while these are just a few look-alikes, and if one throws in the glass imitations, the synthetics etc too. , how would you differentiate between the real and the other masquerading goods? The price for each species differs! Here is where the deeper factors like specific gravity, refractive index etc. of the materials come into play. Gemstoneuniverse gives you the advantage of certainty and provides certification for each of its gems. The certificate from a gem lab ensures and lists vital descriptions for you as a buyer and ascertains that you get what you ask for! 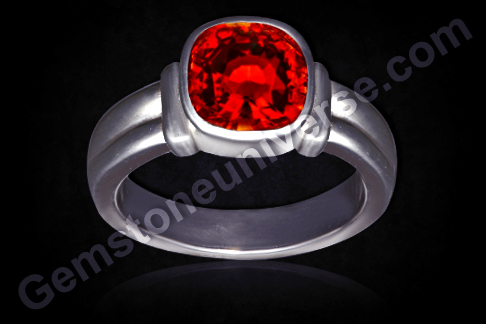 Comments Featured today is a natural and treatment free hessonite garnet of 3.98 carats from Srilanka set in Sterling silver as a Rahu talisman ring. The cushion cut hessonite is a lovely deep burn orange cinnamon in color, doing full justice to its name. The gem has excellent clarity and fiery embers in its belly!Hessonite also known as gomedh/ gomedhaka is the gemstone of the North node of the Moon or planet Rahu.Note: The above links generally exist on the website for a period of 40 days after which they are periodically deleted to make way for new gemstones and to enable faster browsing. The most popular cut for emeralds is the step cut or the trap cut – so much so that it has been named the classic emerald cut. In this cut, the gem has a distinct table with rectangular faces on the crown as well as the pavilion, running parallel to the girdle. The facets are sometimes square with truncated corners. There are two rows on the top, crown, and usually three rows on the pavilion or cone. This cut is preferred cut for emeralds as it allows for maximum weight retention and does give a stable form to this relatively soft gem that rates 7 on Mohs Scale and scratches easily. While this is a great cut for an emerald, the emerald or step cut is unable to bring out the fire and brilliance in gems like diamond. A round brilliant diamond with 58 facets including the culet allow for light to bounce off so many surfaces, creating a spell binding brilliance! And with the diamonds high refractive index, it would be a pity not to get the maximum fire and brilliance from the gem. 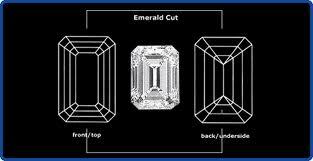 It is a fact that emerald cut diamonds sell at a lesser price than round brilliants! They have their own connoisseurs though. The emerald cut is good bet for emeralds as the clarity is almost always compromised in this gem that invariably forms in nature with multiple inclusions or Jardine. So there is hardly anything to lose in terms of brilliance or fire. Instead the advantage lies in this cut highlighting the rich velvety emerald green color. 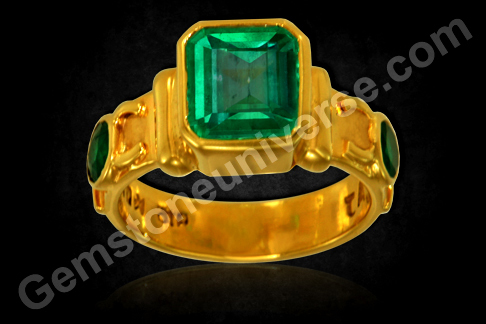 Emeralds over one carat will invariably have one or the other clarity characteristics. So while judging an emerald, one has to be accommodative about inclusions. However, it does not mean that clarity can go for a toss! It means that a good natural emerald must have a diaphanous look, where light passes through the crystals giving it a soft inner glow. Some top quality emeralds from Colombia have clear crystal and therefore may be found in mixed cuts highlighting the stunning clarity and lustre, typical of that geographic location. Featured today is beautiful natural and treatment free Colombian emerald with early summer grass green color. The step cut natural emerald is 2.30 carats in weight and has great clarity, as would be regarded in the world of emeralds. 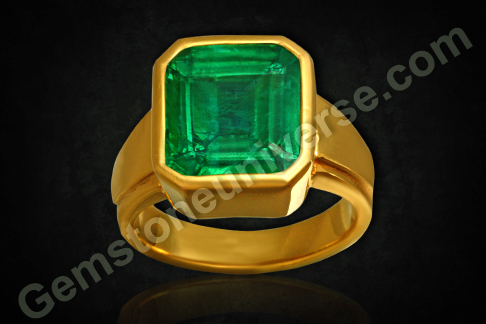 The gem has been set in 22-karat gold with two more emeralds used as accent gems ensconced within the symbol of Mercury.These accent gems are calibrated 3mm rounds and are natural Colombian emeralds, intense deep emerald green in color.Natural emerald or panna is the gemstone of Mercury or Budh and is used to harness its energies in Vedic astrology.Note: The above links generally exist on the website for a period of 40 days after which they are periodically deleted to make way for new gemstones and to enable faster browsing. Natural Yellow Sapphire Jupiter’s Importance in Vedic Astrology, It is Lord Brihaspati or Jupiter’s is the planetary energy that resides in the natural yellow sapphire gemstones. He is such a powerful force in the pantheon that no ritual, no sacrifice is complete without an invocation to him. He is the mentor of the Gods who is also credited with composing the hymns of the Rig Veda, the ancient treatise on which rests Vedic philosophy and wisdom. Jupiter is a saatvik planet and is he significant of dharma, spirituality, wisdom, clarity, fortune, wealth, law and justice. Jupiter is a very important planet for the female individuals as he is the significator of marriage in a woman’s horoscope and determines the relationship with husband. Blessings and grace of Jupiter are also vital for a happy and blissful married life. Jupiter is best placed in the sign of Cancer as it finds exaltation in this sign. It gives good results when placed in the signs of Pisces or Sagittarius, which it owns. Jupiter placed in the 4th house also gives the individual good results as it gains digbala. 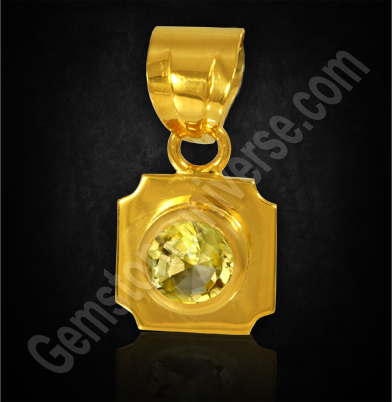 To know more about Yellow sapphire astrology, learn about Natural Yellow Sapphire Gemstones Benefits. Featured today is beautiful natural and unheated yellow sapphire of 1.72 carats set in 22-karat gold as a Jupiter talisman pendant. The cushion cut Ceylon Pukhraj yellow sapphire is a gorgeous light butter yellow in colour and has fantastic clarity. This unheated yellow sapphire from Srilanka has a fine lustre too.Natural yellow sapphire also known as pukhraj/ pushyaraag is the gemstone of planet Jupiter/ Guru/ Brihaspati. The Natural yellow sapphire in vedic astrology is always set in the precious metal yellow gold befitting Brihaspati’s status as the mentor of the gods, the royal priest!